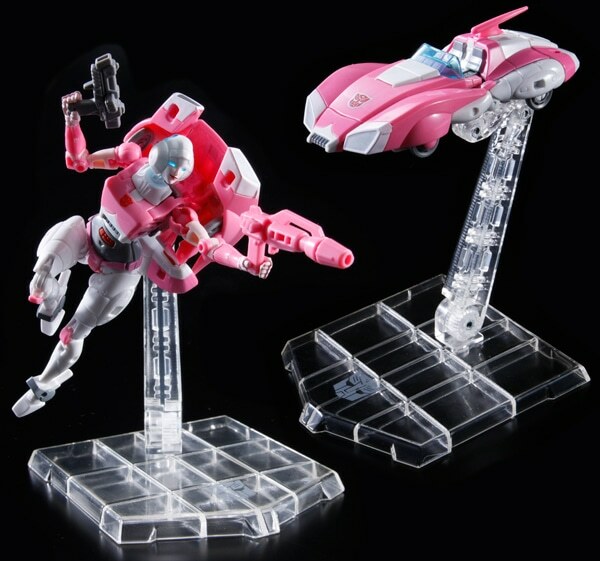 "Takara Tommy mall, product called Transformers dedicated display stand has been registered. 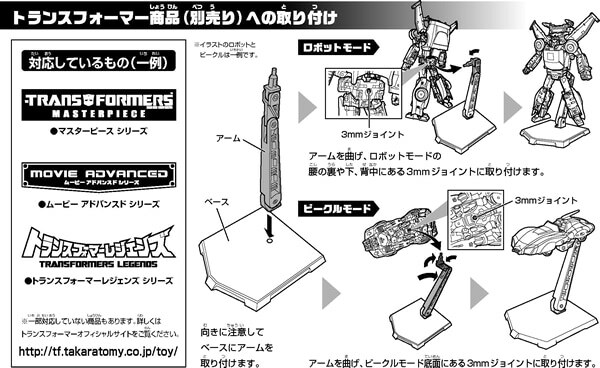 Products, corresponding to certain products of Transformers, the display stand, it seems clear version that comes with a stand of MP-25 Tracks. Corresponding commodity list has also been posted. Sales price, 540 yen. There purchase limit of one to five." Ooh, I am so buying that. Anyone translate that PDF? I can't read a single word. ~$4 each is great. Kind of sick of paying $15 for a single Tamashii stand. 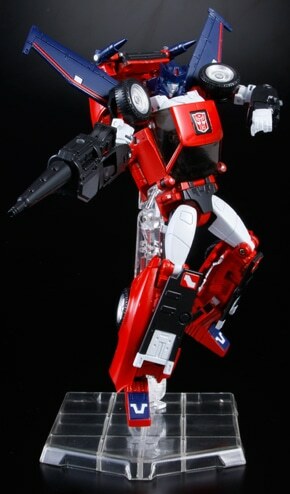 Smart move by Takara if true! Colour me interested (although I currently swear by FlightPose stands). One thing though: the pin on the stand which comes with MP Tracks doesn't seem very strong. I've already read reports of it breaking. Saw this available for pre-order some time ago at some Asian based retailers that get TakaraTomy stock from Hasbro Asia. Nice to see TakaraTomy actually offering it themselves. Having tried out the one included with MP Tracks, it is a pretty good stand but Bandai's Tamashi Stage Act 5 is probably better value for money. 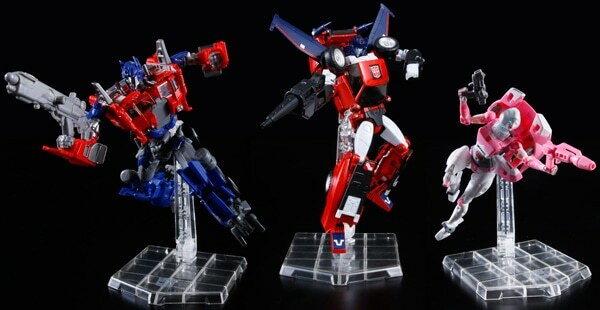 It comes in a pack of 3 for less than double the price of Takara's and has more attachments for various posing options and use with a variety of figures. What stands are you buying? I've bought Tamashii stands in three packs for that much. So as far as Masterpieces go... it works with Tracks and Road Rage in robot and flying car modes (duh), but also Ironhide (and Ratchet), and Hot Rod in robot mode. I might get one for Road Rage. I usually try to wait until they drop to about $9 or $10 to pick one up. The 3mm port is a industry standard peg that works on 95% of the Generations/CW figures made in the last two years or so. I think all the regular sized MPs going forward (Tracks and after) will be compatible. K from dat PDF listing it includes most of the Unite Warriors line, Legends line, some figs from TF AOE line & four MP figs only. I wonder if it can hold CW Superion? Awesome, I'll definitely be picking a few of these up. Excellent. For the MP line it looks like it only works with the Tracks mold, the van bros mold, and Hot Rod. It'd be great if they made some kind of adapter for previous MPs. Pass, don't trust the strength of the peg and the receptacle on the figure; weight of figure is another concern. Awesome. May have to get some. Though I sorta wish there were smaller bases that took up a bit less space, or even more square bases that could combine... but then they'd basically be Tamashii stages I guess. My shelves are packed super-tight after all. 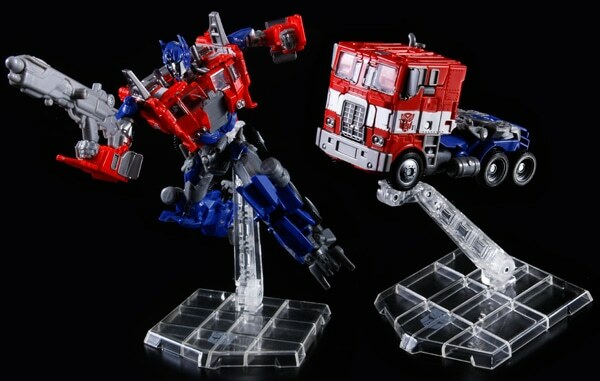 Great news but was anyone else expecting MP seeker stands or the Autobot stand that came with the domestic anniversary release of MP-01? Sweet. Sure it's only a clear version of the MP Tracks stand, but it's still a very decent stand and can hold up a bit of weight without tipping over, unlike the smaller Humanoid Tamashii 3-pack stands. I admittedly broke one of my MP Tracks stands (I had gotten two of the figure), but I just sanded off the broken 5mm peg and attached a clear (large) claw from a Play Arts Kai stand and it's a perfect fit (I use it now to hold up Toy World's Orion as I have him displayed on top of a very high cabinet). Just be careful with the 5mm peg itself as that little connection can break. I also wonder if TT will release a stand with Decepticon symbols. Cons need some love too!